Sunday December 9th 1894 It was not very cold. I was busy about the work all the forenoon. We had early dinner and went over home. Charlie and Ida did not come last night. We came home in time to do the evening work. spent the evening reading and writing. 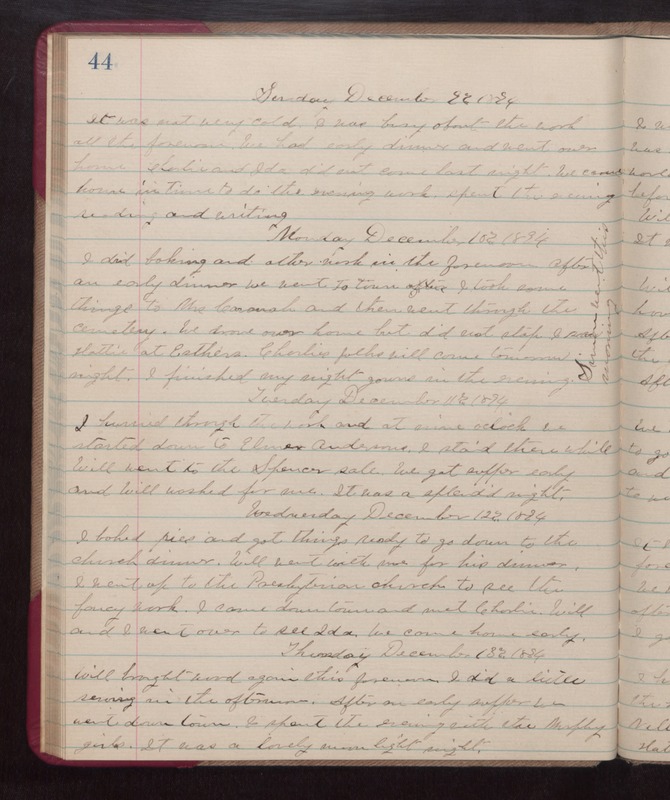 Monday December 10th 1894 I did baking and other work in the forenoon. After an early dinner we went to town. I took some things to Mrs Cavanah and then went through the cemetery. We drove over home but did not stop. I saw Hattie at Esthers. Charlies folks will come tomorrow night. I finished my night gown in the evening. Simon went this morning. Tuesday December 11th 1894 I hurried through the work and at nine oclock we started down to Elmer Andersons. I staid there awhile Will went to the Spencer sale. We got supper early and Will washed for me. It was a splendid night. Wednesday December 12th 1894. I baked pies and got things ready to go down to the church dinner. Will went with me for his dinner. I went up to the Presbyterian church to see the fancy work. I came down town and met Charlie. Will and I went over to see Ida. We came home early. Thursday December 13th 1894 Will brought wood again the forenoon. I did a little sewing in the afternoon. After an early supper we went down town. I spent the evening with the Murphy girls. It was a lovely moon light night.